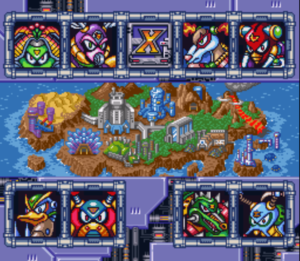 In Mega Man X2 you can select any Maverick's stage to play, but two different routes are suggested below for quick reference. Stages consist of a mostly linear level that contains a mini-boss door containing an X Hunter optional boss and a boss door at the end where you face the main Maverick of the stage. After you beat any two Mavericks, the three X-Hunters will occupy random stages. You can see which stages they're in on the stage select as the ones they occupy will have a Sigma symbol on the map. In an occupied stage, you can find them in a hidden boss door (these doors will be noted in the walkthrough). Defeating them will net you one of three Zero parts which, when all are collected, will change the ending fight. Try and find them as late as possible, as the longer you wait the stronger you'll be. But be careful, because if they run out of stages to occupy you'll lose your chance to fight them. For tips on fighting Violen, Agile, and Serges, check out the Bosses page. During the final stage, Sigma will summon Zero to fight you. However, if you defeated all three X-hunters in the Maverick stages, the Zero will be a fake. The real Zero will bust in and destroy him, meaning you don't have to fight him. This makes the final battle a lot easier. The eight main Mavericks can be defeated in order. The traditional, Normal order used in almost every Mega Man game is to choose the next stage so that its boss is weak against the Special Weapon obtained from the previous boss. Because of the requirements to collect all the items in Mega Man X2, this method requires to re-enter all of the eight stages (except for the last one). An alternative, faster but harder order is possible. With this route all stages only have to be visited just once to collect all items (with just two mandatory exceptions). The drawback is that some boss battles will be more difficult, because the appropriate Special Weapon won't be available yet. In addition some tricks are available to make things easier and allows for less revisits. You have to re-visit half of the stages in order to collect all items. You will fight the last X-Hunter with just the X-Buster. Criteria: (1) 100% item collection and no stage re-entry; (2) fight all X-Hunters with appropriate weapons when possible. Overdrive Ostrich Leg Upgrade: Requires Saw Wheel : No weapon or Upgrade required. Wire Sponge : No weapon or Upgrade required. : No weapon or Upgrade required. Wheel Gator Arm Upgrade: Leg Upgrade required. : Leg and Arm Upgrades plus Speed Burner required. Bubble Crab : Arm Upgrade and Bubble Splash required. : No Weapon or Upgrade required. Flame Stag : No Weapon or Upgrade required. : No Weapon or Upgrade required. Morph Moth Body Upgrade: Saw Wheel required. : Crystal Hunter required. Magna Centipede : Leg and Arm Upgrades plus Speed Burner required. : Leg Upgrade required. Crystal Snail Head Upgrade: No Weapon or Upgrade required : Leg Upgrade required. This page has been accessed 143,599 times.